Apricots! Apricots are finally appearing in the markets and I couldn’t be happier. These are among my favorite fruit and since they have such a painfully short season, we need to seize the day. At the beginning of each season, I always buy a bunch of apricots and wait for their ripening aroma to fill my kitchen. I usually don’t like to do too much to them for my first tasting, so today is about simply roasting them to a jammy lusciousness using a recipe from Claudia Fleming, who adds a touch of chamomile for a slightly floral backnote. Roasting the apricots brings out the intensity of their flavor and acidity, making them truly irresistible. To complement the apricots, I’ve made a Sour Cream Ice Cream that reminds me a bit of the taste of cheesecake without any of the heaviness. 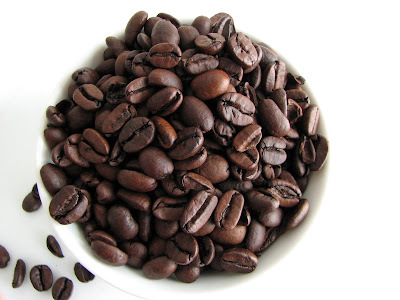 It’s a simple mixture that does not contain eggs and isn't cooked, so it has a very fresh taste. The sour cream is enhanced with buttermilk for another layer of tang and richness. I also add a snippet of cream and milk to mellow and round out the flavor. 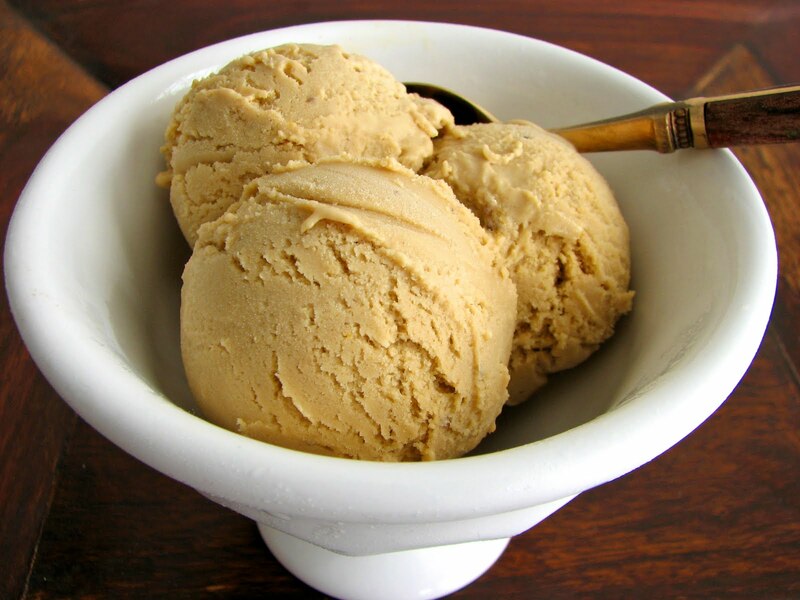 It can be put together in a minute or two and then chilled overnight before churning. 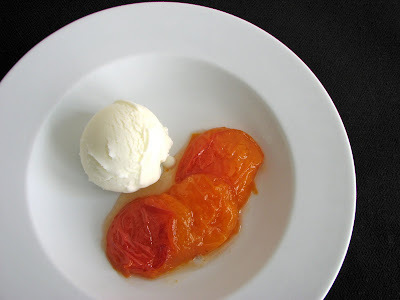 I think the result is a super delicious creamy match for the stewy goodness of the apricots. I love the snow white color against the rich and bright sunset blush of the fruit. I’m still thinking about how good this tastes. I truly hope you have fresh apricots where you live. We have such a fleeting encounter with these gems each year and for me they are among the best joys of the season. Time to stock up and savor every bit of them for this all too brief period of time. I’ll hurry on to make my favorite pastry, an Apricot Galette, as well as try some new ideas. Here’s to glorious fresh apricots! - Baking or roasting apricots accentuates their tartness, so Claudia Fleming’s chamomile syrup is very sweet. 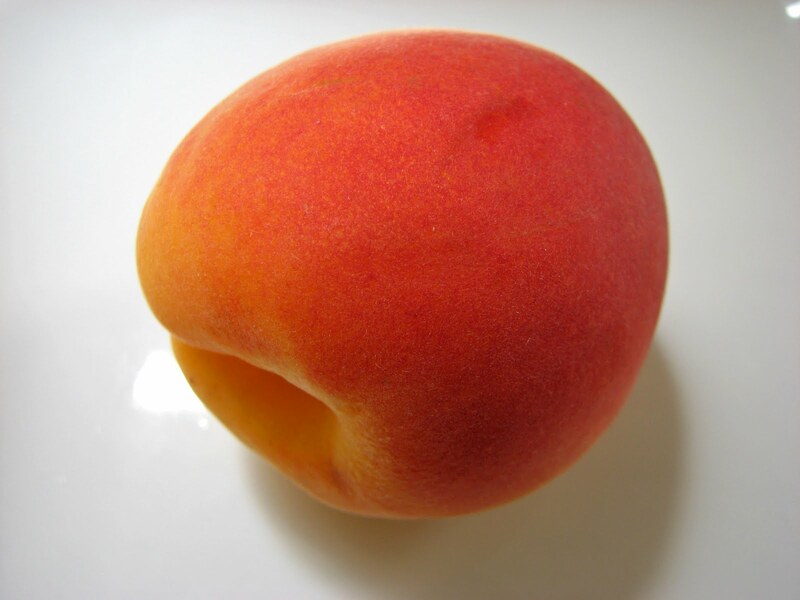 The resulting fruit is tender and succulent. - I made only half the quantity of syrup and I thought it was plenty, but I've included the full recipe here. If you don't have fresh chamomile, you can use 6 good quality chamomile tea bags. - I like to chill the ice cream base overnight to give the flavors time to ripen. 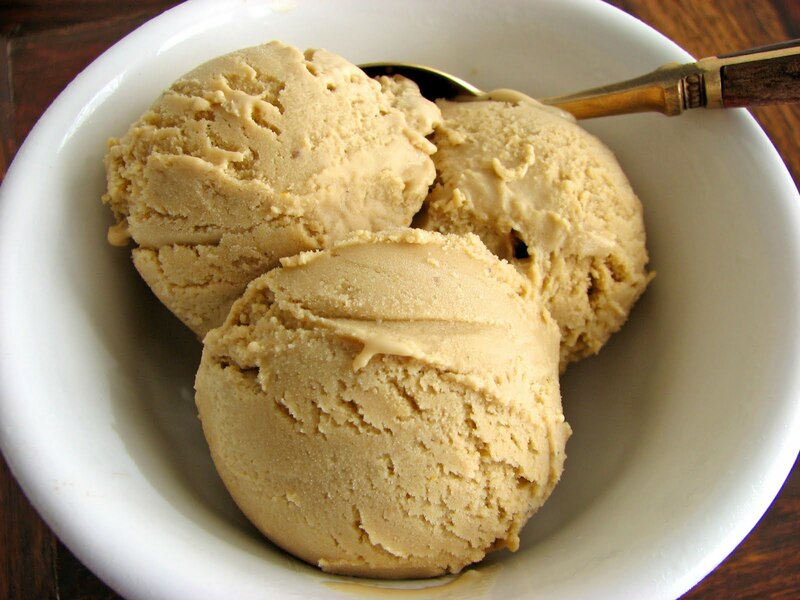 - The recipe for the ice cream makes about 1 pint and should be doubled if you want to have some left over. I think it would be really wonderful with any and all spring and summer fruit. In winter, it would be luscious with Fleming's Roasted Dates with Sherry and Spices or Roasted Pineapple with Pink Peppercorn. - I always save apricot pits to make Noyau Ice Cream, an indescribably delicious ice cream with the subtle taste of beautiful almond, perfect for cuddling up to fresh peaches or nectarines, figs, raspberries and just about everything else. - Claudia Fleming's cookbook is out of print and I see that copies are now going for around $149. There are some very good cookbooks that retain their value but it's astonishing to see these prices. Better to follow your instincts while your favorites are in print and purchase these beautiful cookbooks in good time! - Another must have every apricot season is Cornmeal Cake with Apricots. 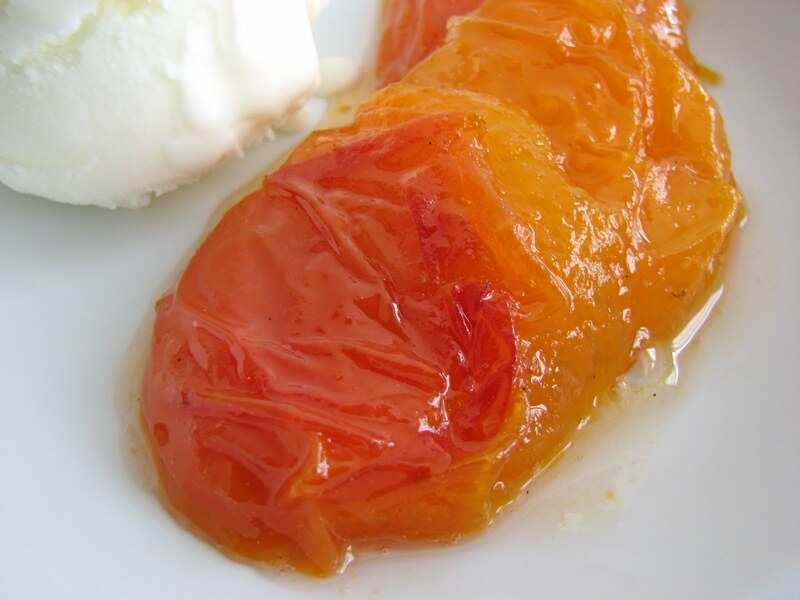 Once you try the apricot compote, you won't be able to think of anything else every time you see an apricot! For the ice cream, whisk together the sour cream, buttermilk, cream and milk. Add the lemon juice and salt. Chill thoroughly, preferably overnight. Churn according to your machine’s directions. Pour into a clean airtight container, press a piece of plastic wrap into the surface, cover and place in your freezer to firm up. Make a heavy syrup by placing the sugar and water in a pan and bringing to a boil. Split and scrape the vanilla bean and place the seeds and the pod along with the chamomile into the syrup and simmer on low heat for about 10 minutes. It will have the consistency of honey. Cut the apricots in half and remove the pits. Place the apricots cut side down in a baking dish. Strain the syrup over the apricots, pressing on the chamomile flowers to extract the flavor. Roast for about 10 minutes. Turn them over, baste with the syrup and roast for another 5 minutes. 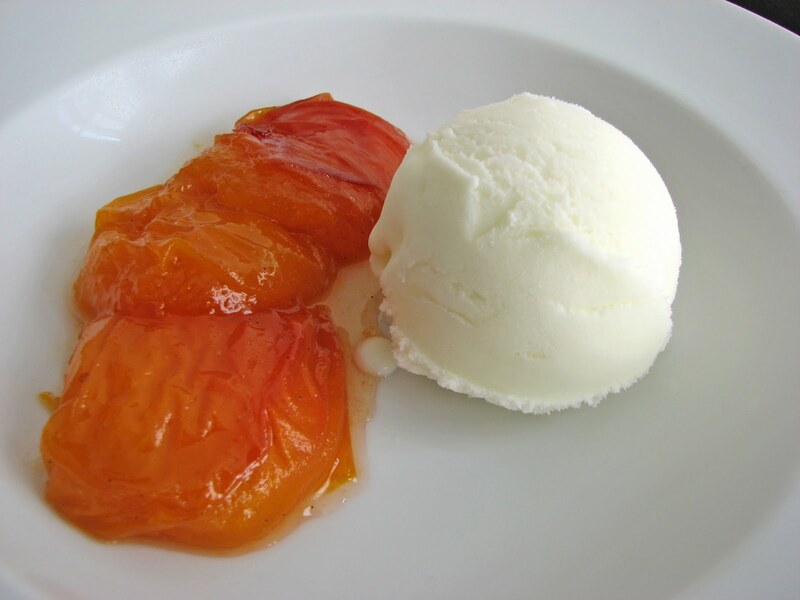 Remove from syrup and serve with Sour Cream Ice Cream. As I wait patiently for the arrival of more spring fruit, I return again to my favorite staple, apples. 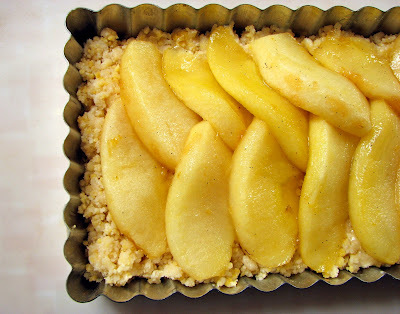 I always have apples on my table so they quickly became the focus of this great little tart. 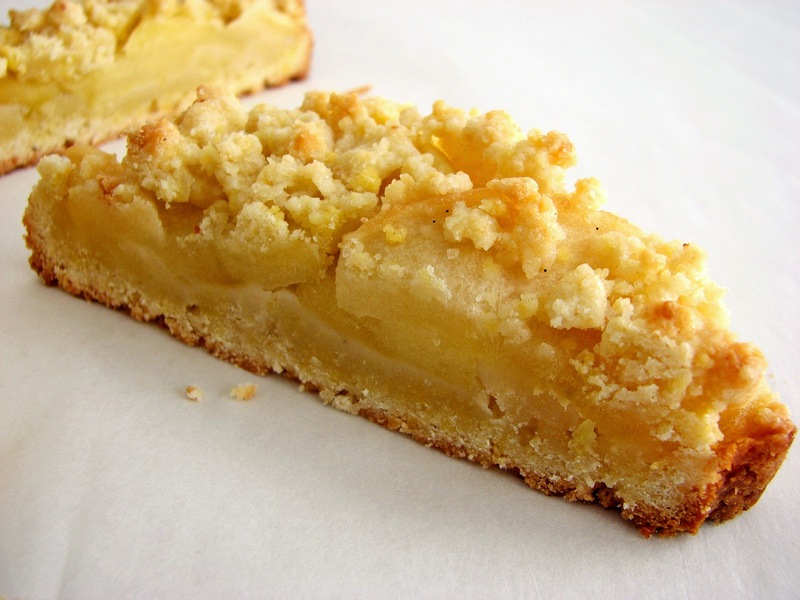 This is a very easy crust that envelops apple slices lightly sugared and sautéed in a bit of butter. To that I’ve added one of my favorite flavor combinations for apples, vanilla bean and lemon zest. Just before putting the tart in the oven, I sprinkle a very tiny bit of crushed fleur de sel over the top. The end product reminds me of a French apple tart without having to chill and roll out the crust. This tart is rather simple and rustic but very delicious in its own way, not too sweet or heavily spiced. The flavor and texture of the apples balance each bite nicely. It would be perfect for brunch, an afternoon snack or as a dessert course with some great cheddar cheese. - For more flair, you can add a little bit of finely chopped thyme or rosemary to the apple sauté in place of the vanilla bean. If you prefer a more American treatment, use brown sugar to sauté the apples and add a pinch of cinnamon. Sprinkle a little bit of cinnamon sugar on top of the assembled tart before baking. - Fleur de sel (flower of salt) is a special salt harvested by hand. 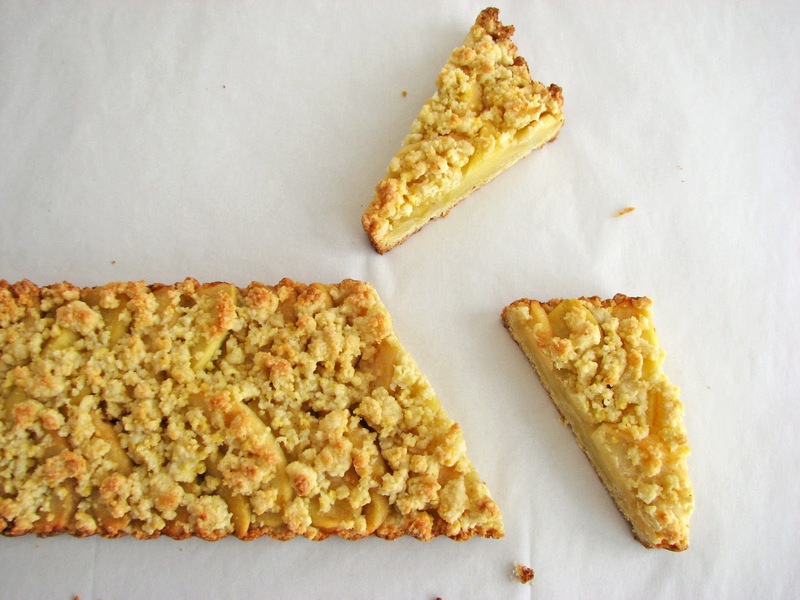 It has a flaky texture and a softer flavor. For this pastry, I crush it with a rolling pin for a fine sprinkle. - I'm often asked about baking pan substitutions. You always want to try to substitute a pan that has the same volume so you don't have to adjust the baking time and you can still wind up with a similar presentation of height. The Baking Pan has a very good list of dimensions and volumes that they've accumulated from several authoritative chefs and cookbooks. It has lots of different sizes and types of baking pans for easy comparison. Prepare the apples by peeling, coring and slicing them 1/4” thick. Melt the butter over medium heat and add the sliced apples, sugar and lemon zest. Slit the vanilla bean, scrape the seeds and add them and the bean casing to the mix. Sauté the apples for about 5 – 8 minutes or until they are softened a bit and the aromas of the vanilla and lemon zest have permeated the fruit. Set aside to cool. Place the flour, sugar and salt in a food processor and pulse to combine. Add the butter pieces and pulse until the mixture looks like coarse meal. Mix the yolks and sour cream together and add to the food processor. Pulse just a few times until the mixture looks like it’s coming together. Do not overmix. The dough should be very crumbly. Pour into a large bowl and toss gently with your hands. Pour about 2/3 of the dough crumbles into a 14” x 4” tart pan or a 9” tart pan. Gently spread an even layer without compressing it. Just make sure that the pan is covered and there aren’t any holes. Layer the cooled apples on top. Sprinkle the remaining dough crumble over the top of the apples. Sprinkle with a tiny bit of fleur de sel, if desired. Place the tart on a sheet pan lined with parchment and bake for 40 – 45 minutes. Cool completely before removing from the tart pan to serve. I love the interesting combination of panna cotta and granita. 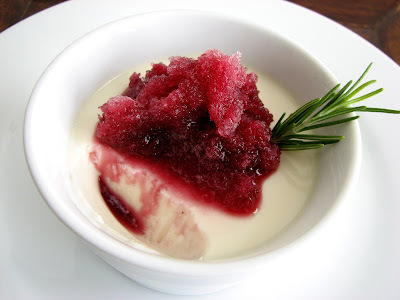 The texture of panna cotta is creamy, the flavor is beautifully basic and spare. The granita is icy and the flavor is usually quite concentrated. As one begins to melt into the other, you wind up with a playful exchange of both. Panna cotta has all the virtues of an eggless custard, which can be put together in a matter of just a few minutes. 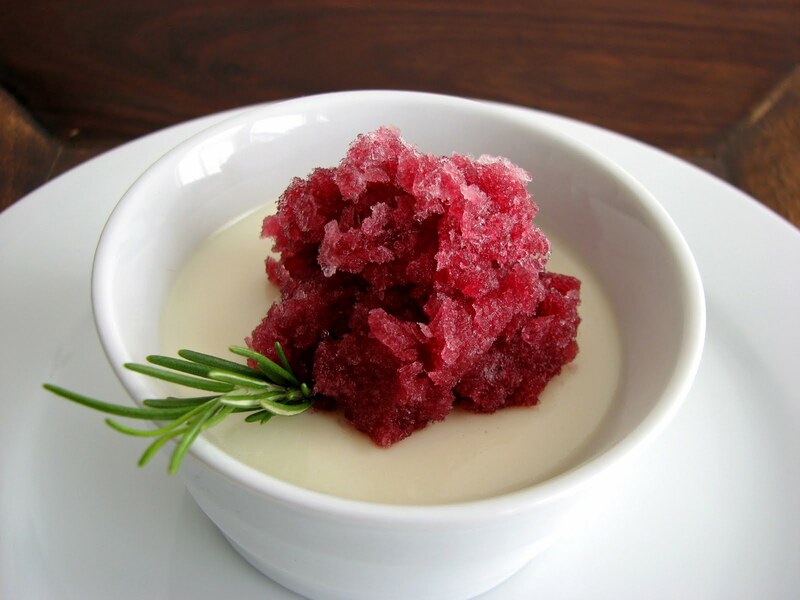 Granita also has the advantage of quick preparation without the need for any extra machinery. So there's really nothing to prevent you from having a little bit of Italy on your table if you're feeling up for the journey. 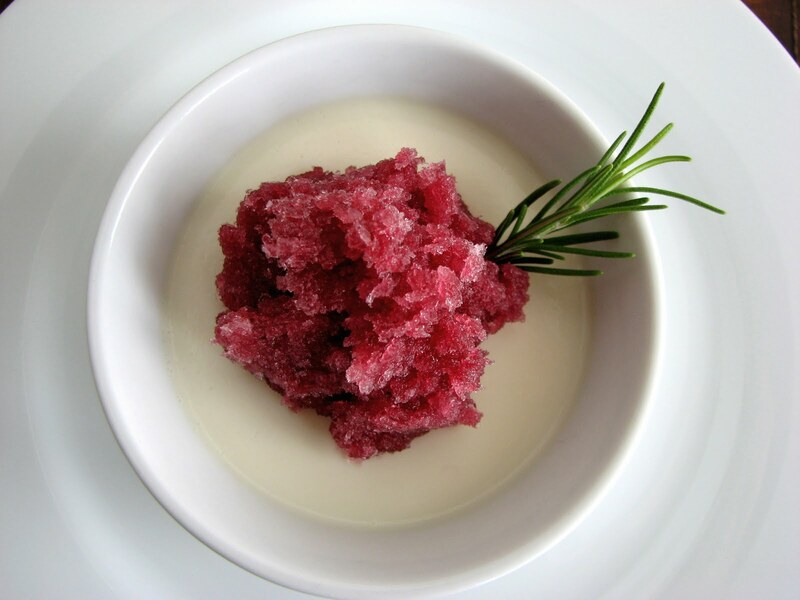 This dessert matches a simple vanilla panna cotta with a spiced red wine granita. Each component is delicious on its own, but together they make for an unusual and enjoyable treat, perfect for the coming warm weather where there will be lots of occasions to share delicious meals with friends and family. - I use a minimum amount of gelatin to make the panna cotta because I don’t unmold it and I like the silkier texture for this dessert. - Sprinkle the gelatin into the cold water rather than the other way around to keep lumps from forming. - Use your favorite red wine. I chose a Tempranillo wine this time around and it was great, but any fruity Zinfandel, Cabernet, Syrah, Pinot or Merlot will work. For the granita, combine all ingredients into a saucepan and simmer on low for about 10 - 15 minutes to concentrate the flavors. Cool completely. 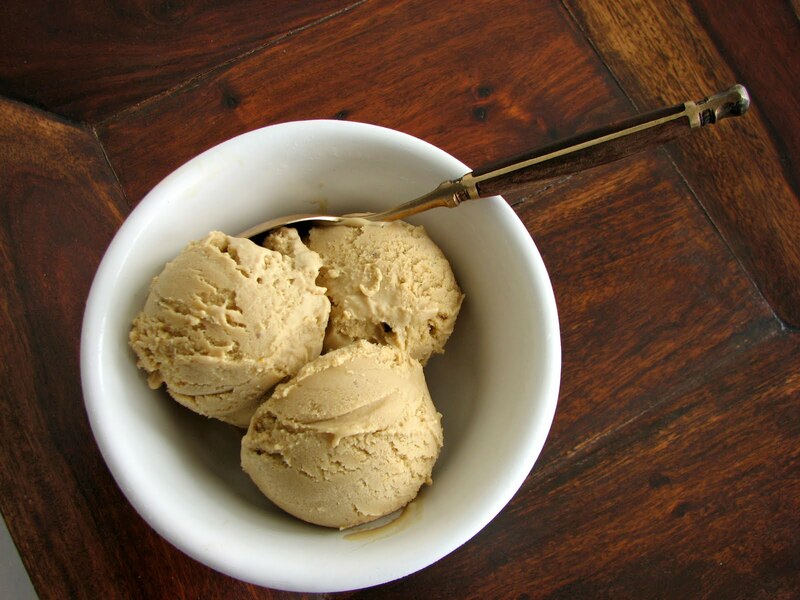 Strain into a shallow airtight container, cover and place in your freezer. After about 2 hours, take a fork and scrape the surface of the granita to form icy crystals. Place back in the freezer and repeat again in an hour or so. For the panna cotta, place 2 tablespoons of water in a small dish. Sprinkle the gelatin over the water. Let sit for a few minutes to bloom. Bring the heavy cream, half and half and sugar to a slow simmer over moderately low heat, stirring until sugar is dissolved. Remove from heat. Add the vanilla, lemon juice and a pinch of salt and whisk thoroughly. Set the bottom of the dish of bloomed gelatin in a pan of simmering water to melt, then whisk into cream mixture. Pour the panna cotta into parfait glasses or dessert dishes and chill in the refrigerator for several hours or overnight until firm. To serve, garnish the panna cotta with a couple of tablespoons of the granita and enjoy immediately.